Even with American troops headed soon from an increasingly quiet Iraq to a more turbulent Afghanistan, defeating extremists in Afghanistan is growing more complex and more urgent, President Bush's senior defense advisers say. "Frankly, we are running out of time," Adm. Mike Mullen, chairman of the Joint Chiefs of Staff, told the House Armed Services Committee on Wednesday, referring to the international effort to stabilize Afghanistan. "I'm not convinced we're winning in Afghanistan," said Mullen, adding quickly, "I'm convinced we can." What is needed, he said, is better Afghan governance, more foreign investment, a viable alternative to poppy farming, greater cooperation with Pakistan and more U.S. nonmilitary assistance. 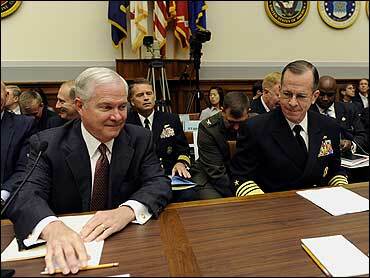 Mullen and Defense Secretary Robert Gates, testifying together one day after President Bush announced that one Marine battalion and one Army brigade would be shifted from Iraq to Afghanistan this fall and winter, both stressed the futility of relying too much on military power in Afghanistan. "We cannot kill our way to victory," Mullen said. Gates did not address the issue of whether U.S. forces are winning, but after the hearing his press secretary, Geoff Morrell said Gates sees the conflict as an ill-fated attempt by the Taliban to overthrow the government. "The secretary believes we won the war in Afghanistan back in 2001-2002 when we drove the Taliban from power," Morrell said. "They no longer run the country. They no longer control any significant territory within the country; however they are trying to reassert themselves ... and they will not be successful." U.S. commanders in Afghanistan say they need another 10,000 troops - about three times as many as they will receive this winter under the troop deployment Bush announced. The commanders also urge more nonmilitary aid and say the Afghan government must perform better. Gates said the insurgency in Afghanistan has gained "greater ambition, sophistication and coordination" since 2006, and he underlined the importance of denying them haven in neighboring Pakistan. "As in Iraq, until the insurgency is deprived of safe havens, insecurity and violence will persist," Gates said. He was alluding, at least in part, to the effect of having eliminated Iraq's Anbar province as a haven for Sunni Arab insurgents - a key to recent overall security improvements in Iraq. Mullen, who has visited Pakistan frequently since he became Joint Chiefs chairman last fall, made a similar point. "Until we work more closely with the Pakistani government to eliminate the safe havens from which they operate, the enemy will only keep coming," he said. He lauded the efforts of U.S. and allied troops to hunt down the Taliban and other insurgent forces and their progress in training and expanding the number of Afghan security forces. "But until those Afghan forces have the support of local leaders to improve security on their own, we will only be there as a crutch - and a temporary one at that," said the four-star admiral. Meanwhile, Pakistan's military chief, Gen. Ashfaq Parvez Kayani, lashed out at the U.S. Wednesday, saying the cross-border military raids executed in the last week were not in keeping with any military agreement between the two nations. The House committee hearing was remarkable in its lack of partisan debate over U.S. strategy in Iraq and for its sharp focus on what more can be done to stabilize Afghanistan, the launching pad for al Qaeda's terrorist attacks on Sept. 11, 2001. In response to those attacks, U.S. forces invaded Afghanistan in October 2001 and drove the Taliban out of power in a matter of weeks. The Iraq war began in March 2003 and has consumed vastly more U.S. military resources. Meeting with Bush in the Oval Office on Wednesday, Iraqi President Jalal Talabani praised the president's military buildup, saying, "There is no inch of Iraqi land under the control of terrorists." Bush told Talabani - who recently had knee surgery and a shunt placed in an artery at the Mayo Clinic in Rochester, Minn. - that conditions remain difficult in Iraq, but security gains were allowing him to pull out troops. "The Iraqis want there to be fewer U.S. troops," Bush said. "The United States wants there to be fewer U.S. troops. But both of us want to realize that vision based upon success." Rep. Ike Skelton, D-Mo., the committee's chairman, applauded "the military's successes" in Iraq while also arguing that the Bush administration has failed to do all that is necessary in Afghanistan. "When will the conditions in Iraq be good enough, and when will the conditions in Afghanistan have deteriorated enough to warrant the re-prioritization of focus and resources that's required to ensure the long-term success of the Afghanistan mission?" Skelton asked in his opening statement. Neither Gates nor Mullen had a precise answer. Both made clear that Iraq will remain a priority, and Gates said he hoped the next U.S. administration takes a "cautious and flexible" approach to Iraq. "I would also urge our leaders to keep in mind that we should expect to be involved in Iraq for years to come, although in changing and increasingly limited ways," Gates said. Republican presidential nominee John McCain has said he would keep U.S. forces in Iraq as long as it takes to achieve victory, and that he would not withdraw forces until security conditions allow. Democratic presidential nominee Barack Obama, meanwhile, proposes to withdraw U.S. combat forces within 16 months. Gates hinted at possible further troop cuts in Iraq next year, but he also said a go-slow approach is justified by several circumstances, including slow progress on the political front. "I worry that the great progress our troops and the Iraqis have made has the potential to override a measure of caution born of uncertainty," Gates said. "Our military commanders do not yet believe our gains are necessarily enduring - and they believe that there are still many challenges and the potential for reversals in the future."